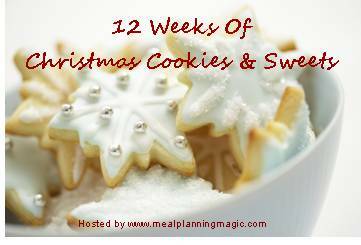 Awhile back, I signed up to take part in a blogging event called "Twelve Weeks of Christmas Cookies & Sweets." It seemed like fun to share our favorite holiday recipes over the course of 12 weeks. Sometime in October, I sat down to write my first post for the series ... and I just couldn't finish it. I felt that I was like one of those stores who puts up Christmas decorations before Halloween. It was too soon for me. So I'm just now finishing that post and participating in the Blog Hop. I hope to make 12 contributions, just not over 12 weeks. 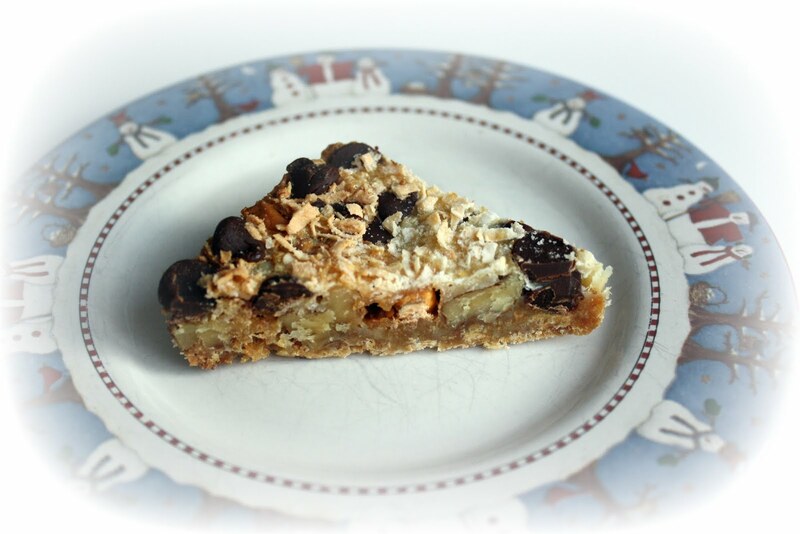 The first is The Magic Cookie Bar, or Seven Layer Bar, or Hello Dolly bar, depending on where you're from. I go for the magical title myself. - They are fairly flat when they are made as written (shown above). If you like a thicker bar, just use a smaller pan. - I have a friend who uses food coloring to color her coconut to make her bars more festive. You could also use other flavored chips instead of the butterscotch chips. - You can also use different kinds of nuts (I don't like leaving them out because the nuts help keep them from being cloyingly sweet). - Another great variation is this banana cookie bar recipe, created by Anna at Cookie Madness. She used a chocolate shortbread crust and adds banana to the topping. Preheat oven to 350°. Melt butter in a 13 x 9-inch baking pan. (If you like them thicker, try a 7 x 11 pan.) Sprinkle crumbs evenly over melted butter; pour sweetened condensed milk evenly over crumbs. Top evenly with remaining ingredients; press down firmly. Bake 25 to 30 minutes or until lightly browned. Cool magic cookie bars before cutting. My favorite way to eat them is refrigerated. Oh My, I had these for the first time a few years back, they called them Hello Dolly's. I think I ate like 10 in one sitting. I cannot make them, I would eat them all, yours look so good! This is really interesting, You are a very skilled blogger. I am looking forward to read more of your wonderful post.